Then disaster; I couldn't get any red sweetcorn and when I text James to tell him I found out he'd been in a car crash. Apparently an articulated lorry (driven by an Italian) careered across 3 lanes of traffic and hit his van head on, smashing it to pieces and left poor James skidding down the road on his arse with just his Levis for protection. Then I remembered - I had food colouring at home, I could make my own red sweetcorn, disaster avoided! It was a 4am start, with no van we took the first train and we were on the river to watch the sunrise. James headed off in search of grayling, I was going to spend the first half of the day chasing jacks. Wobbling a trout deadbait I hit a pike first cast, about 3lb and as he was ready for the net the hook pulled - it shot past my head as the pike legged-it. Only 3lb but I couldn't help wondering how important he might be to the Predator Challenge. 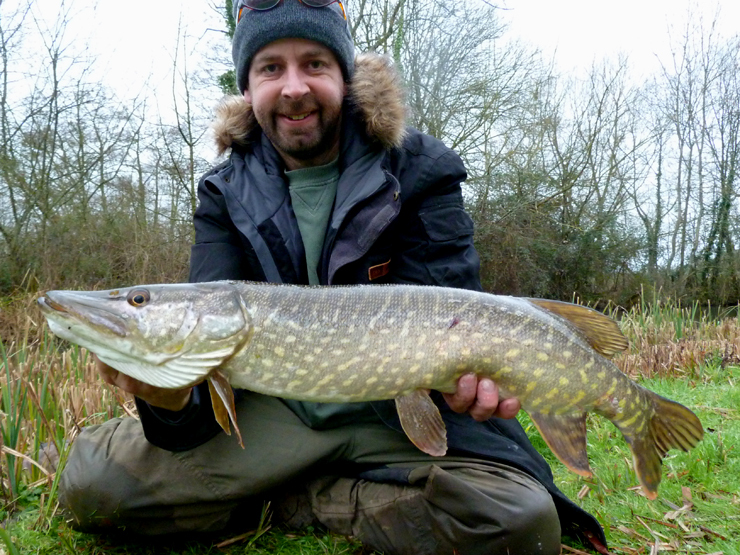 It wasn't long before I was in again and added three more pike to the challenge weight; 7lb 2oz, 6lb 7oz and 2½lb. Then I couldn't even spot another pike, and can't help wondering if the new otter population has all-but wiped them out - in the past I have seen up to 20 pike here in one day. 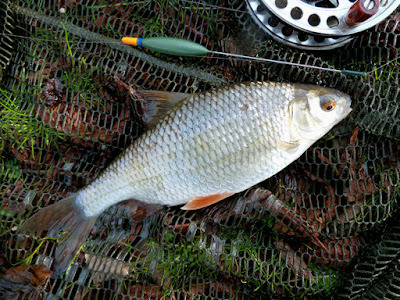 I opted to set up a stick and pin and join James chasing grayling for the second half of the day. James had been struggling to avoid the ever hungry trout, but I caught up with him in time to photograph a lovely grayling - but I'll leave that to his blog. While he was holding it in the water I took the opportunity to poach one from his swim. 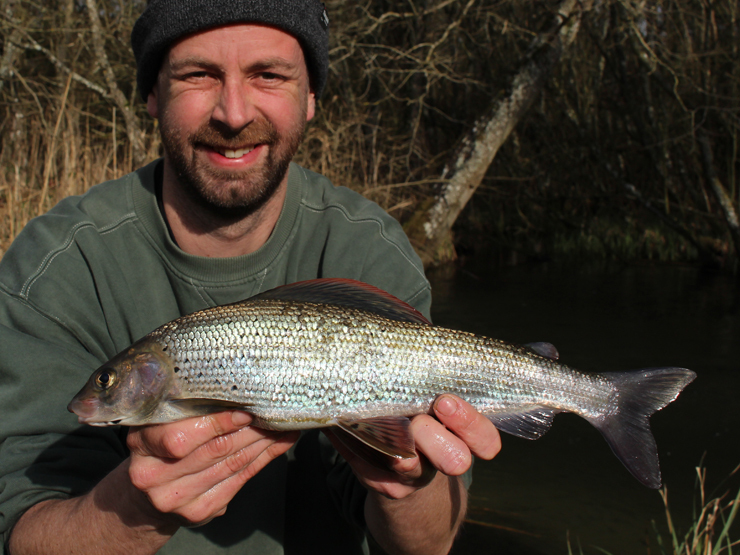 I too struggled to avoid the trout, but did eventually find twelve grayling, the best two both going 1lb 5oz, stunning looking fish in their winter colours. I did hit a salmon which took me on a merry ride around the river on light line, but just as it went in the net - with James shouting "don't loose it, don't loose it" - it turned into a brown trout. We were both totally convinced, and as James had the camera to hand we took the quick snap above. For the last half of the day we decide we were going to sit on a roach shoal we'd both spotted on previous visits, fishing a variety of static baits on the tip. Watching the odd fish glide over the shallows we knew we were in 'two pounder' territory. I soon had one about 8oz (sending the float through), a beautiful looking roach and an hour or so later James upped the weight with a pounder. We fished into the dark with high hopes but they were very spooky fish - especially for ones that had never been fished for - I wanted to end this post with a photo of a two, not caring which one of us was holding it (it would probably have been James). But I've said it before and I'll say it again, great day - we'll be back! Predator Challenge: 297lb 11oz. I knew that lost three pounder would be important! Ready for round two!! Let's hope these play ball......Terminator is ready. And what a round two, it's rare when the sequel is as good! 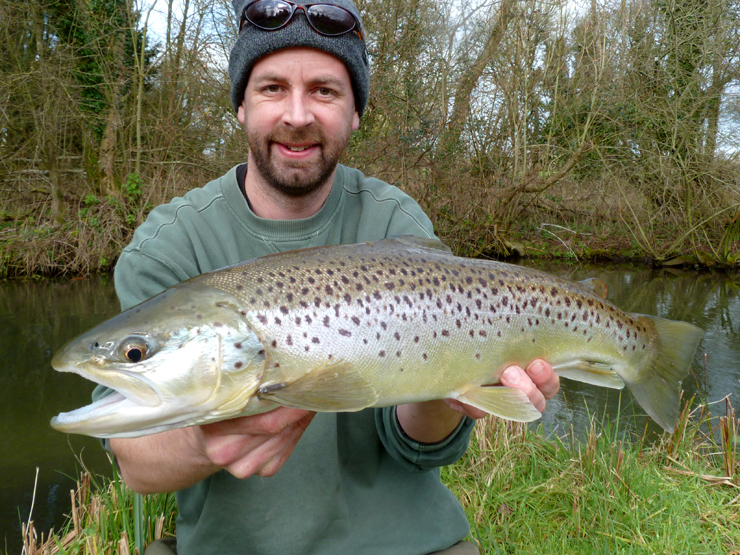 2lb 5oz to go, which I need to get asap - in case the rest of the season in a wash out. And James managed a two pound roach the following morning - knew it would be him but I had my chance!